to buy more vegetables, cooking oils and eggs to sell to customers with retail businesses. Romina benötigte 200 US-Dollar, um ein Gewerbe im Bereich Nahrungsmittel auf- oder auszubauen. Das Geld wurde gesammelt und für Romina bereitgestellt. “Talipapa” is an indigenous term meaning flea market, popular in streets in the Philippines. Many offer customers fresh produce, baked goods, plants from local farms, snacks and drinks. 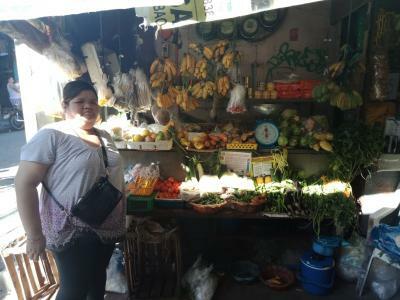 Romina owns a vegetable stand in a talipapa in their community. She's had her business six years and attracts repeat customers. Through this business, Romina is able to help her family income. She wants to increase her inventory as she's asked by more and more customers to sell cooking oil, especially by those with retail businesses. She's asking to borrow 10,000 PHP to buy bottles of cooking oil, vegetables and poultry eggs to sell to customers who have retail stores. Through this, Romina will be assured of regular customers who buy in bulk.